The information presented on this page was originally released on January 21, 2015. It may not be outdated, but please search our site for more current information. If you plan to quote or reference this information in a publication, please check with the Extension specialist or author before proceeding. MISSISSIPPI STATE -- Mississippi’s horse owners and riding enthusiasts have a new resource to assist them with issues related to pleasure and competitive equine activities. 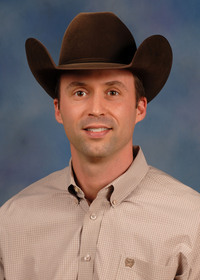 Clay Cavinder, an associate professor in the Mississippi State University Department of Animal and Dairy Science, is the new Extension horse specialist. Before joining MSU on Jan. 1, he was on faculty at Texas A&M, where he earned his doctorate in 2006. Cavinder has conducted research related to equine reproductive issues. Cavinder, a native of Oklahoma, said countless testimonies about the benefits of judging horses and other livestock influenced in his professional goals. Cavinder said another one of his goals is to improve communication between riders and their horses. For more information about the 4-H horse program or future clinics, contact the county Extension office or email Cavinder at clay.cavinder@msstate.edu.